Well, there was snow and there was dirt and there was even some company on this one. Nikcee and I rolled out of Fed Square before dawn and chatted our way along Canterbury Road into the eastern suburbs. Not the most exciting terrain but we made good time and cleared most of the suburbs before the saturday traffic woke up. Climbing up to Mt Evelyn was a nice taster of what was to come. We rolled past Cog Cafe but it wasn't open yet so on, on to Launching Place. Some nice sized rollers between Mt Evelyn and Launching Place. Bombing descents and good road surface. Nick got a good wobble going on one descent and had to back way off to keep it under control. Made me wonder, can you get speed wobbles on a fixed-gear? Or is there so much motion going on what with the pedalling and all that any little shimmies would just be soaked up in the mess? Launching Place was the last town before the big climb so we had a break and loaded up on food and drink. Beautiful countryside out that way - so green and lush at this time of year and the day was shaping up nicely with clear blue skies and the big hills starting to loom larger and larger. We rolled out and left the main road behind in favour of the back roads. Huge old-growth trees and big houses - cool and damp and smoky - it seemed to be the day for burning off undergrowth and reducing the fuel load or something - saw a bunch of people building little fires in their front yards. The locals were pretty cheery - we stealthily rolled past a couple of ladies walking their dog on the road and they jokingly called after us, "Oh! We didn't hear you. Where's your little thing? Your horn, you need a horn!" We took the lesser road again and it turned to dirt pretty soon. Nick went at his own pace which was faster than mine, especially as the gradient increased, so we each made our way up and up by ourselves until we got to the base of the real climb, Mt Donna Buang Road. The road was closed to cars for winter and there was a big metal gate and plenty of "Road closed go away" signs. So we scooched under the gate and then we had 16km of road all to ourselves. Only problem with a closed road is there's no cars to sweep all the crap off it. There was debris everywhere - everything from leaves and thin bark to branches and even full trees across the road. And then the road turned to dirt and so puddles and soft patches added to the obstacle course. Nick was far ahead by now and I was slowly pushing on, trying to maintain a slow circular rhythm while weaving all over the shop to avoid branches and puddles and whatnot. I had a couple of walk breaks to stretch the back a bit and give the legs a rest. Good excuse to take a few photos too - the view was getting more and more spectacular as we cranked up the vertical metres. Slowly grinding up the hill, I saw a break in the trees coming up and a big loading ramp hanging off the side of the mountain. My first thought was, "What sort of idiot loading ramp is that? You'd slide right off it down the mountain!" So I stopped and sniffed around a little and finally worked out it was a hang glider launch ramp. Aha! Stuff's meant to go flying off it down the hill. Awesome view from that spot - must be amazing to just launch off it out into space. Around about here was where the snow started. Just icy crud on the sheltered side of the road but still, snow! It was also about here that I got a great view of Mt Dandenong way down in the distance. And then it struck me, back in May I almost bailed out of my ride to the top of Mt Dandenong after spinning my way up the smooth gentle incline of the 1:20, and now here I was looking down on it from almost twice the height having hacked my way up there on an unused dirt road. Wasn't long after that I reached the gate at the other end of the closed section and joined the main road. Sign said 1km to the summit and the road was now clear, paved and smooth apart from the odd icy patch. Felt pretty steep though and I was happy to come round the corner and see the carpark and then Nick clapping me in. He'd made it up there 20 minutes previous and, like a true champion, he'd waited for me at the carpark so we could hike up to the tower together. 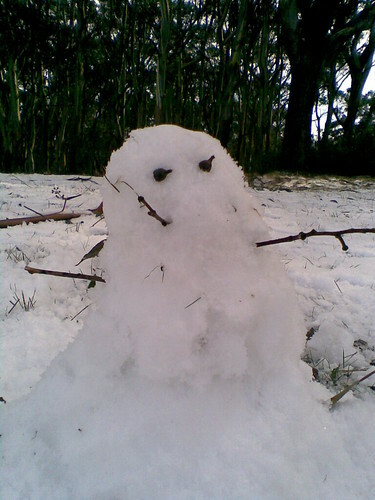 Felt obliged to make a little snowman so I did that and then we click-clacked down the icy road to the carpark and prepared for the descent. Arm warmers, windblocker vest, double gloves. We decided to head down the main road to Warburton instead of retracing our steps down the gnarly closed road. It would have been a slow and tricky descent down that way so we both buckled in and hit the main road. Nick took off and I started spinning down the hill with a handful of brakes the whole way. It was about 12km down to the bottom so I tried to stay loose, I rode the brakes on and off, did a bit of leg braking to mix things up, always kept the speed well under control. Not very exciting, I know, but it was probably my relatively slow pace that contributed to me spotting a lyrebird running off into the bushes as I fanged past. Lyrebirds are awesome! Nick was waiting at the bottom and we hit the bakery for some refuelling. We decided to take the Lilydale-Warburton Rail Trail on the way back rather than hit those rolling hills again and I've gotta say I'm glad we did. It felt good to spin along the flat at a decent pace after the slow grind up and the cautious ride down Donna Buang. We motored past plenty of horses and families and wobbly dads on mountain bikes and decided to roll right on to Lilydale and catch the train from there. Heading back into the city on Canterbury Road just seemed like work at that point - we'd already done the fun part and put in a good 150km so we didn't feel bad at all about heading trainways. So, we popped out the end of the rail trail onto the main road and we'd rolled less than 200 metres before a pickup truck full of dickhead kids starting yelling abuse at us. It was obvious we'd returned to "civilisation". Rolled down to the station and straight onto a waiting train. Excellent. And then an announcement came that we had to change at Ringwood and get on a connecting bus service to Blackburn. Crap! I hate false endings! So we saddled up again and rode straight up Maroondah Highway to Blackburn station where another train was already waiting. I think we beat the stupid bus but the train waited for it anyway. And so we eventually rolled into Flinders Street about 4:30.